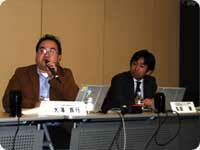 The Awards Ceremony was held at Akihabara Convention Hall on 16 February! The Awards Ceremony took place as a conference session of the Global IP Business Exchange, an event held over the period of 15-16 February. 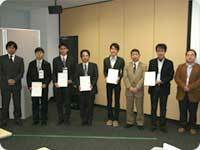 After the lecture entitled "The actual status and future prospects of IPv6 Applications"	by Prof. Kazumasa Kobayashi of Kurashiki University of Science and the Arts, we had the Awards Ceremony for the winners of the Appli Contest. General Manager, Rapidsite Business Dept. GMO Hosting & Security, Inc.
8 people of all who were awarded the Top Prizes or the Awards of Excellence in each Award Category attended the ceremony. After the ceremony, we had speeches by Mr. Matsuda of IRI Ubiteq, inc and Mr. Takahashi of Tsuken Advanced Systems Corporation about the development of IPv6 Applications. You can check the Grand Prix entry and all Award Winning entries at the following site. IPv6 Appli Contest 2005 Evaluation	Committee recently completed a	thorough review of 16 entries to the Implementation category from	7 countries and 322 entries to the Idea category from 7 countries. This process culminated with the selection of the Grand Prix, the	Top prizes and the Awards of Excellence. Click here for details. Idea of the month, December Announced ! Idea of the month, November Announced ! We have received the large number of applications. We appreciate your works ! The Awards Ceremony will be held at Akihabara Convention Hall on February 16, 2006. The Ceremony will take place as a conference session of the Global IP Business Exchange 2006, an event held over the period of 15-16 February. Deadline extended for all categories. Idea of the month, October Announced ! Entry registration for all categories now being accepted online. Implementation Category requires Advance Entry Registration to be completed by November 14. IPv6 International Appli-Contest 2005 will be staged again ! Idea	Category and Implementation Category. In the Idea Category, Idea of the month is newly-created. Please check here for the details. All entries will be accepted from early September. For an outline of the IPv6 International Appli-Contest 2005, please click here! * Note: Implementation Category requires Advance Entry Registration to be completed by November 14. Software submissions will be accepted from registered entrants from 17 October. Please refer to the following web site for Winning Entries of 2003 and 2004. The Awards Ceremony was held at Tokyo International Forum on 16 November! The Awards Ceremony took place as a conference session of the Global IP Business Exchange, an event held over the period of 16-18 November. Check out the details below ! 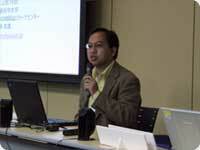 *Shigehiko Kaneko, Managing Corporate Officer was absent for unavoidable reasons. After the discussion of application of IPv6 to business was provided by presenters,	we had the Awards Ceremony for the winners of the Appli Contest. 7 people of all who were awarded the Top Prizes or the Awards of Excellence in each Award Category attended the ceremony. Mr. Higashi from TOA Corporation who attended to receive the Grand Prix on behalf of his company gave a speech noting this prize acts as an encouragement for development. You can check the Grand Prix entry and the comments on all Award Winning entries at the following site. All works introduced on the site can contribute current and future IPv6 Applications. Copyright (c) 2005 IPv6 Promotion Council. All Rights Reserved.